Although the term "peacock" is often used to refer to males and females, the true name of the species is the Indian peafowl (Pavo cristatus). Males are known as peacocks and females as peahens. As their name suggests, they're native to India, but also live naturally in surrounding countries. In other parts of the world, they're more commonly kept as ornamental birds. Several differences exist between males and females. The most obvious difference between male and female Indian peafowl is their coloration. Males are usually an iridescent shade of bright blue. This bold coloration helps them to attract mates. Females, on the other hand, have much more subdued plumage. Their feathers tend to be either brown, gray or cream in color. Females have white bellies, while males' bellies are the same blue as the rest of their plumage. Although males look far more attractive, females have the advantage in the wild, as it's easier for them to camouflage themselves and avoid predation. Another gender difference when it comes to Indian peafowl is size. Measuring in at between 3 and 4 1/2 feet long and weighing between 9 and 13 pounds, males are significantly larger than their female counterparts. Peahens tend to measure between 2 1/2 and 3 1/2 feet long and weigh between 6 and 9 pounds. One of the most noticeable things about male Indian peafowl are their enormous trains -- or tail feathers. Females of the species have no train at all. Male trains can measure 4 to 5 feet long, longer than the rest of their bodies. Each of their long tail feathers has an ornamental ocellus, also known as an eyespot. They can fan out these feathers to display to females during mating season. 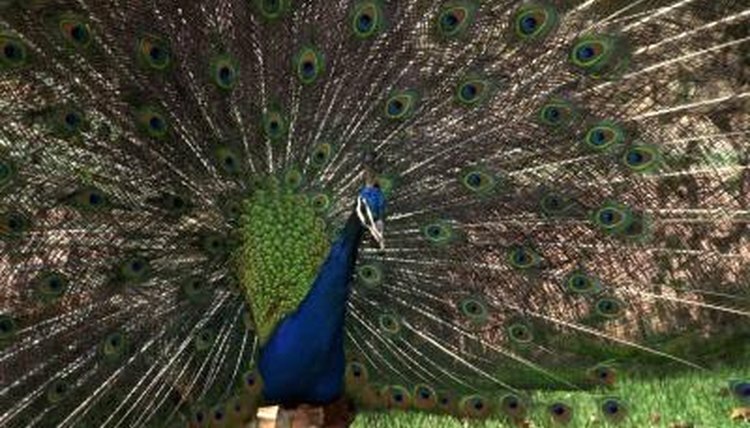 Peacocks molt around January each year, losing their trains, but rapidly regrow them by June, ready to impress the ladies. You can tell the difference between male and female Indian peafowl by looking at their behavior, especially during breeding season. Males exhibit various displays that females don't, such as train-rattling and wing-shaking. Females can become aggressive when it's time to mate, fighting with other females for the best male specimens. Only female peafowl build nests and incubate the eggs, with males showing no parental involvement at all. In the wild, both males and females can live in small groups or alone, but males are more likely to be solitary.